Keep up to date with the latest happenings in Lathrop, including meetings, events and weather alerts. Click here to sign up. 8/6/2018 - Parents, please be aware that bikes are not allowed on the sidewalks downtown. We seem to have several young bike riders that enjoy riding on the new sidewalk in front of the Post Office. We bring this up as we get a lot of pedestrian traffic in that area and an adult recently got knocked over by a bike rider. If you have any questions, please contact City Hall or the Police Department. Thanks in advance for you assistance with this matter. Please note: The restrooms at the City Park will now be locked at dark. The restrooms will be unlocked every AM. If you have reserved the park for an event, a key will be provided. Once known as the Mule Capital of the World for shipping thousands of mules around the world during the Boer War and WWI, Lathrop, Mo. was born on the railroad, and survives on the interstate. Incorporated in 1867, Lathrop’s rich history is only matched by its bright future. Ideally located just three miles off I-35 and Mo. Hwy 116, the City of Lathrop boasts of an infrastructure that includes not only the main north/south interstate corridor, but now offers fiber optics to the home (FTTH) from Grand River Mutual/Lathrop Telephone Company. 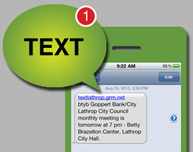 The City of Lathrop and the Lathrop R-II School District also offers residents up-to-minute text and email alerts about important city and school news & alerts. And now residents of Lathrop can pay water/sewer/trash utility bills and municipal court payments online! If you would like a paper copy please call City Hall at (816) 740-4251. *When clicking the bill payment link, you will be redirected to the bill pay website for the City of Lathrop. 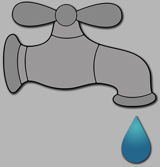 Utility payments are for the City of Lathrop water, sewer and trash. Municipal Court payments made via this link are only for the City of Lathrop.